Make sure the pan you will be using is large and oven-safe. I use cast iron, because you get the best sear. Do not over-crowd the pan while cooking the chicken. This can affect temperature and cooking time. There should be space between each piece of chicken. Cook in batches if necessary. Add 3 Tsp of the butter to pan and place over medium-high heat. You may need more or less, depending on size of pan. Pat dry chicken very well and season with salt, pepper and paprika. Once the butter in the pan is golden add the chicken, skin side down. Sear skin for about 6-7 minutes, without turning. If you suspect burning, turn heat down. Once the skin has browned and crisp, turn over using a metal spatula. Cook for about 3 minutes the remove from heat. Remove from chicken from pan and set aside. Melt the remaining 3 Tbsp of butter and whisk together with the garlic, pepper and lemon juice. Add to chicken broth. Pour half of the liquid into pan, being careful of any splatter since the pan will still be hot. Deglaze pan using the liquid, making sure to scrape any chicken bits from the bottom of the pan. Return chicken to pan. Add remaining liquid to the pan, pouring in from the side and not on top of the chicken. Fill in gaps with lemon slices. 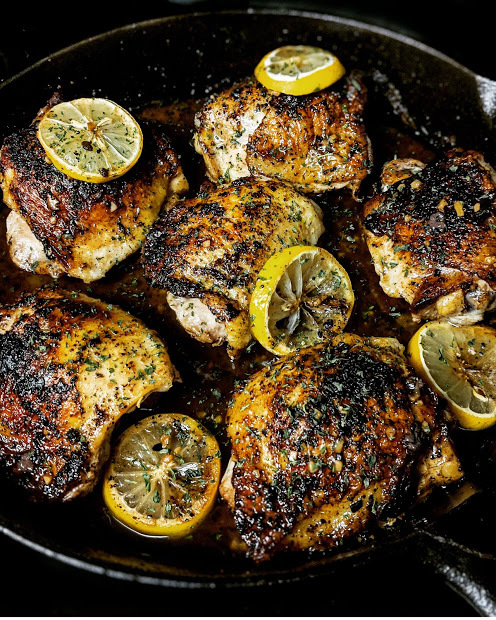 Place pan in oven and cook for about 15 minutes or until internal temperature reaches 165 degrees F. Drizzle chicken with pan sauce and garnish with parsley.